That unresolved argument I had with my best friend when I was 17 flashed across my mind as my eyelids closed shut. I rolled over in my bed and pulled the covers closer as my heart began to sink. I realised that there’s an urgent to-do that I should add to my task list for tomorrow. But no wait, there’s another incoming memory. Remember how terrified I was when my parents came home late one night when I was 5 and I couldn’t stop crying as I waited by the window? Remember that? Because tonight, and every night forth, I will. And that, ladies and gentlemen is the daily night of an insomniac, where willing yourself to rest is an arduous necessity and sleep doesn’t come easy even for the weary. I certainly am not the only one, because more than 2.7 million Malaysians suffer from the same thing as I do. Several months back though, I discovered ASMR (Autonomous Sensory Meridian Response) and while I wouldn’t say its life-changing per se, it has definitely helped me through a handful of sleepless nights. I figure the core reason as to why it works so well is the very fact that it slows the mind down, giving it less thoughts to ponder upon, until we eventually drift off to dreams. Here are 6 of my favourite ASMR videos on YouTube (so far) and why I think they’re pretty rad at knocking people out. The 15-minute video is presented by YouTuber, Harry Hushes and we can hear him gushing about his favourite hairstyling products and why he found them useful. Harry, whose actual name is Sam, whispers happily throughout the video and if you don’t fall asleep immediately, you’ll at least get to find out what Harry’s favourite cologne is. Psst. It’s Montblanc. This is a new one for me, and as it’s always good to have a variation of ASMR videos on loop, I decided to give it a go. The 31-minute video by YouTuber, GentleWhispering, was made because she realised that whenever she feels nervous, she would begin crumpling and crinkling objects such as paper in order to calm herself down. Needless to say, the video is full of soothing sounds of her tapping her long manicured nails across surfaces such as a box full of tea. Sounds which successfully lull one to sleep vary from person to person, and that is exactly why this video is awesome. It is an 11-minute video compiling a variety of ASMR triggers (a sound or a stimuli that triggers an Autonomous Sensory Meridian Response in a person). These triggers range from dragging a highlighter across newspaper, shoe-shining and even solving a Rubix cube. I stumbled upon this video whilst watching a bunch of prominent YouTubers like Alex Wassabi and the guys from instrument-free band, Pentatonix, react to ASMR. YouTuber, MassageASMR is a guy who puts a serious amount of effort into the production of his videos and it becomes obvious when listening to him tapping and crinkling objects for 10. whole. hours. Also, the plus point is that you are bound to fall asleep at some point in this video, so it’s a safe bet. After countless ASMR videos, one is bound to encounter ASMR immunity which what happens when ASMR is no longer effective in putting one to sleep. YouTuber Freds Voice tries to combat that issue with this 24-minute video of him not only discussing ASMR immunity, but also creating tapping and crinkling sounds so as to expedite rest. Hence, expect lots of tapping and crinkling sounds coupled with laugh-whispers at some point. Yes, laugh-whispers, because Fred tends to do that from time to time in his videos. I can’t be the only one who enjoys haircuts at the salon, especially when we get a hairwash at the same time! It’s a therapeutic session for me, and this 26-minute video simulates the moment when you’re seated at the hairdresser’s, anticipating a brand new ‘do. If you happen to be wearing earphones or headphones (which is recommended for ASMR), whilst listening to this particular one, you just might drift off quicker into a dream about spas, and well, who wouldn’t want that? ASMR may not be for everybody and there are definitely those who find it incredibly creepy (case in point: these YouTubers). Sure, someone gently whispering you to sleep isn’t exactly a textbook remedy for insomnia. However, seeing since we are already so attached to our mobile devices and YouTube is an social media platform widely used daily, this could just be an option that you could utilise to lull you to sleep from time to time. 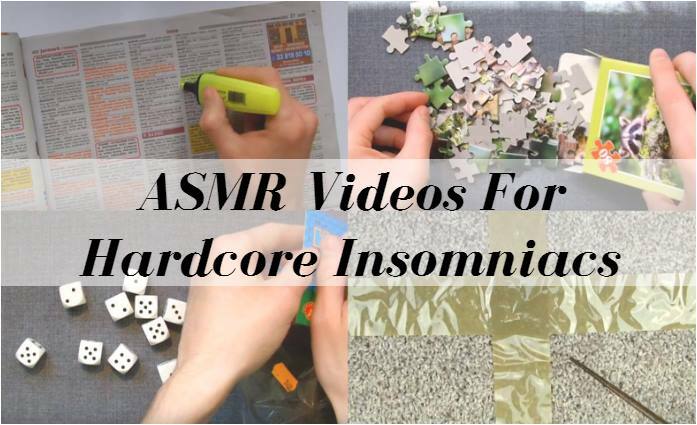 After all, history textbooks and long lectures aren’t the only cure for insomnia where ASMR is concerned. Sleepless In Subang is a bi-weekly series where our writer, Anna, tests out sleep-inducing methods to battle her bouts of insomnia. From sleep teas, to apps to help catch the Zzz’s, they certainly don’t consist of counting sheep to sleep—because yes, Little Bo Peep wants them back. So What’s The Big Deal About Bespoke Fitness Anyway? We Tested It Out.